It’s time once again for a post about the biggest influences on me as a fan of Dungeons & Dragons. This time around, we’ll look back at the world of that distinctly 80s item, the interactive gamebook. More specifically, we’ll discuss the TSR branded gamebooks: the Endless Quest series, and the more game-like follow ups, Super Endless Quest (also known as AD&D Adventure Gamebooks). Like most every kid who grew up in the 80s, I loved Choose Your Own Adventure books. You’ve likely heard of them, even if you never read one. These books don’t read straight from front cover to back cover, but instead present the reader with choices at different points in the story. These choices send the reader to different pages, where the narrative unfolds in various ways. You an read the same book over and over again with different outcomes each time. As a kid, I found the concept fascinating, and sought out as many Choose Your Own Adventure (hereafter abbreviated CYOA) books as I could find. The CYOA books were a smashing success, spawning the development of other, similar lines. Two of my favorites were the Time Machine and Be an Interplanetary Spy series. Time travel was a natural fit for exciting adventures, and I read Search for Dinosaurs over and over again in the summer of 1984. The Interplanetary Spy series focused more on puzzles, mazes, and other brain teasers, often requiring the reader to write in the book. 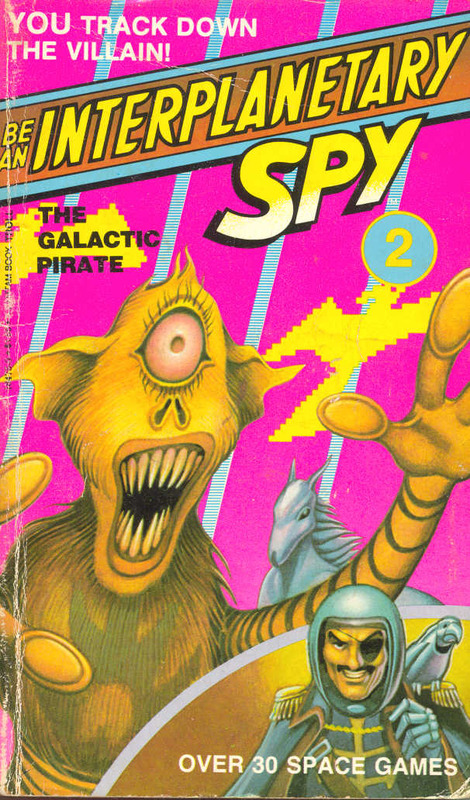 I still have my battered copy of The Galactic Pirate. TSR got in on the gamebook action, too, starting with the Endless Quest books, the first of which hit bookstore shelves in 1982. I was immediately drawn to these books. Not only did I love the gamebook format, but the cover art was amazing! And of course, they were branded with the Dungeons & Dragons name, which I was familiar with from the cartoon. Unsurprisingly, I read as many Endless Quest books as possible. 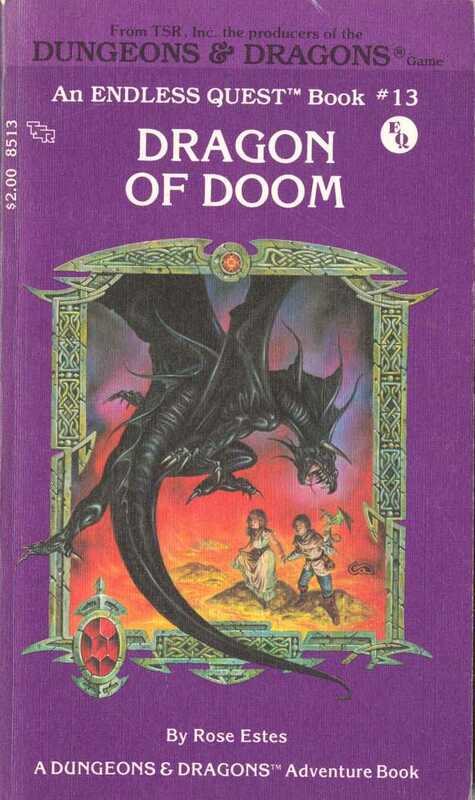 Dragon of Doom, in particular, was quite memorable for me. I picked up my copy at a bookstore in a mall in another city we were travelling through. Pardon a brief aside: when I was young, going to a new bookstore was like entering the tomb of King Tut; who knew what exotic new treasures could be found within? I pored over the shelves of every library, grocery store, and newsstand I could, looking for the next great book. Finding something I hadn’t seen before was such a thrill. Now, you learn about new products weeks or months in advance, and I’m not sure if that is as big a benefit as it seems to be on the surface. In hindsight, it is clear that, aside from cashing in on the gamebook fad, the primary purpose of Endless Quest was to get kids involved in TSR games. Dungeons & Dragons was the most popular, for sure, and so most of the EQ books were set in the world of Greyhawk. But there were also a few Gamma World books. Interestingly, a handful of books featuring licensed characters like Conan and Tarzan was available. The 2nd person perspective of Endless Quest, as well as the decision making aspects, made the transition from a book to the full-fledged RPG a smooth one. The Super Endless Quest line made this natural progression even easier. 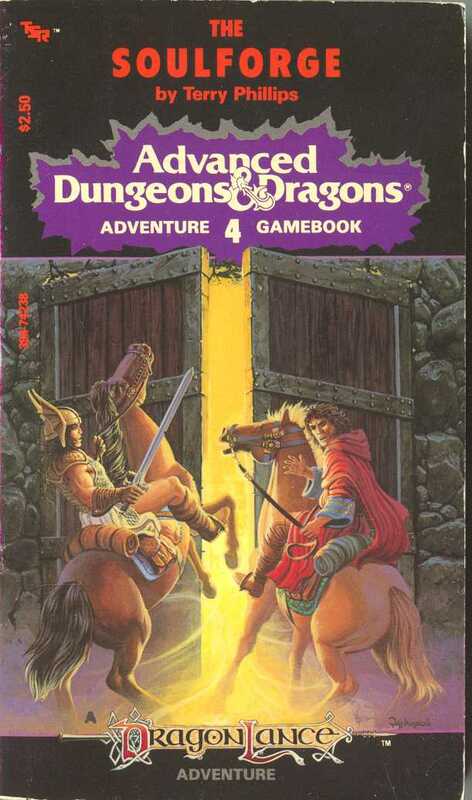 This series changed its name to AD&D Adventure Gamebooks early on in the run, and for good reason. These books provided a bookmark that doubled as a character sheet, including such concepts as hit points, spells, and inventory management. There was even a little bit of character customization, where you could spend points on different ability scores. In essence, each AD&D Adventure Gamebook was the same thing as the solo adventure from the Mentzer Basic set: a fantastic introduction to role playing games. The AD&D Adventure Gamebooks were a big part of my development as a fan of role-playing games. When I couldn’t get together with the group, I could still go on an adventure just by opening the pages of one of these stories. While the TSR books were always the ones I sought out first, I also voraciously devoured the Lone Wolf books and even a few Fighting Fantasy entries. Such was my mania that I even developed a few new characters for use in my gamebooks. Gamebooks were an excellent outlet for my creativity, and ignited a love for roleplaying games in me that is still unquenched more than twenty years later. 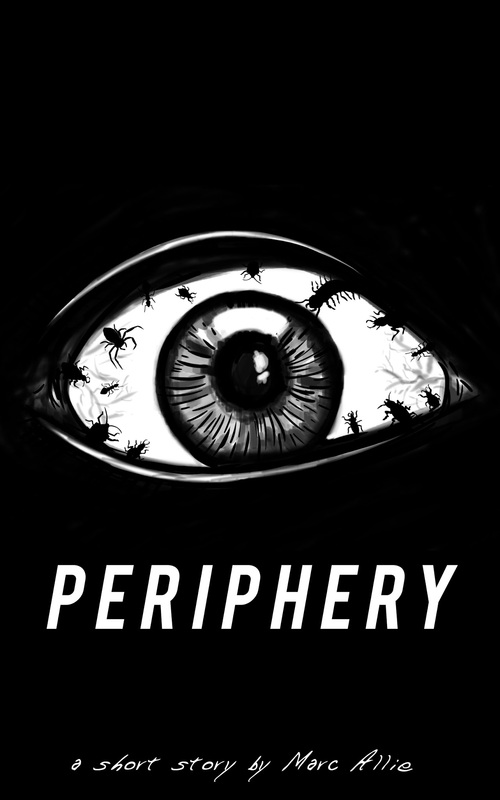 I highly recommend readers who are interested in Endless Quest or other gamebooks to check out Demian’s Gamebook Web Page. Though a bit hard to navigate, it’s a tremendous storehouse of information, and was where I found the pictures in this post. Thanks Demian! This entry was posted in D&D, DM Advice, Dungeons & Dragons, Roleplaying and tagged Adventure Gamebooks, D&Development, Endless Quest. Bookmark the permalink. It’s insane that this became a 36 book series, followed by a second series in the mid 90’s (according to Designers & Dragons, an excellent book. There were issues with over-committing and relationships with Random House ultimately led to serious problems in 1996, when returns from publishers and thus loans becoming due became key issues leading to the sale of TSR. It is fascinating how novels have been so integral to the history of D&D! 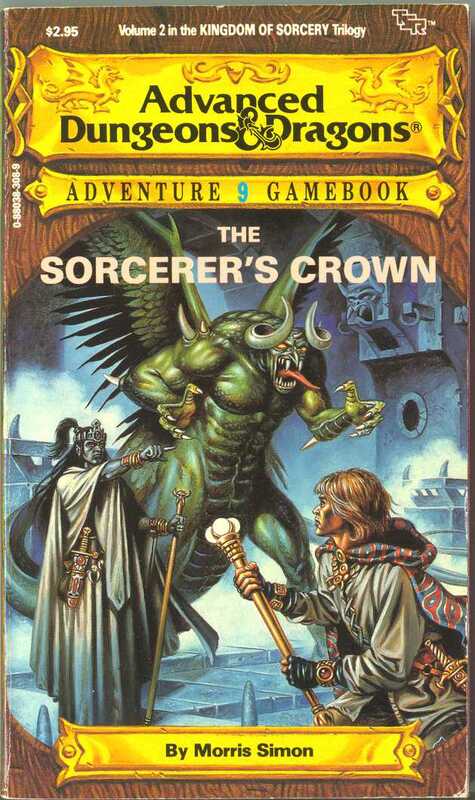 You’ve neglected to mention a couple of my favorites from the AD&D series: first are the two prequel/sequel novels to the Sorcerer’s Crown (respectively, Sceptre of Power & Clash of the Sorcerers), and The Ghost Tower, whence arises my intense love of the mod Ghost Tower of Inverness. I’d also be amiss if I didn’t point out to readers that what might be the most successful gamebook series of that era, the Lone Wolf books by Joe Dever, are now available free and online at Project Aon (projectaon.org). The English editions have released the first 25, and are doing a mammoth editorial clean-up following the Mongoose editions of many before progressing onto Long Wolf book 26 and other Dever works.